What’s your Christmas wish this year? Show you care from afar with these beautiful festive florals in a silver gift bag. 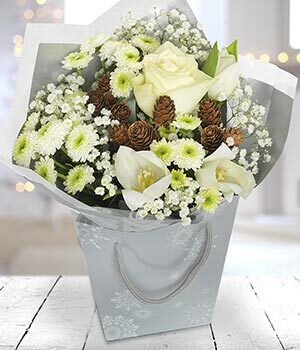 Couriered straight to the door of your recipient, this ‘Christmas Wish’ bouquet is a fabulous gift for a loved one you can’t be with this festive season. Packaged in bud for optimum freshness, our floral Christmas Wish will bloom into the bouquet of their dreams in the home.